1. Perfumer Ernest Beaux, who was given the task of creating Chanel No. 5, believes the scent was born out of Gabrielle ‘Coco’ Chanel’s ‘reminiscence’ of her lost love for Arthur Capel, the English polo player and lover of the fashion house founder, who tragically died in a car accident in 1919. By channelling her grief into creativity, this ‘perfume of eternity’ was her personal gift to herself. 6. No. 5 can be seen as the olfactory double of artistic movements such as Cubism, Dadaism and Surrealism, in how it aspired to attain absolute modernity, and this is explored in the Paris exhibition. 7. The number 5 was also symbolic at the time of its creation, linking to several other pieces of art including composer’s Igor Stravinsky music, The Five Fingers. 8. Coco Chanel starred in No. 5’s first publicity campaign herself in 1937, shot by photographer François Kollar for the US version of Harper’s Bazaar (see picture below). Unusually, the perfume wasn’t advertised in France until the 1940s. 9. 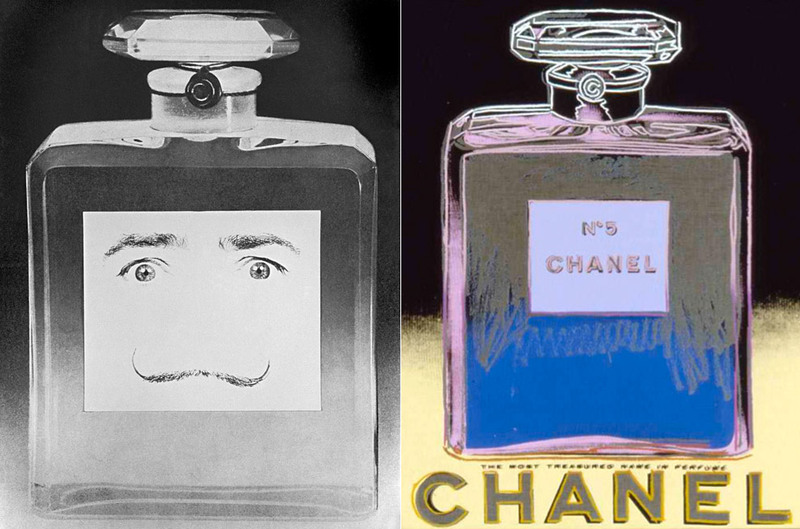 Several of Chanel’s close artist friends, including Salvador Dali and Andy Warhol, painted pictures of the iconic No. 5 bottle (see picture above). 10. The black and white box design that houses Chanel No. 5 is the same as the original packaging used in 1921. 11. On the black wax seal of the neck of the 1921 No. 5 bottle, Chanel placed a ‘C’, the first letter of her surname. She would then turn this into a monogram by doubling it and the luxury label’s famous logo was born. 12. The interlocking ‘C’ logo also closely resembles the curved patterns featured in the stained glass windows of the church of Aubazine, where she spent her childhood in an orphanage. 13. The logo has also been compared to the royal monogram of French Queen, Catherine de’ Medici, who many believed Chanel admired. 14. 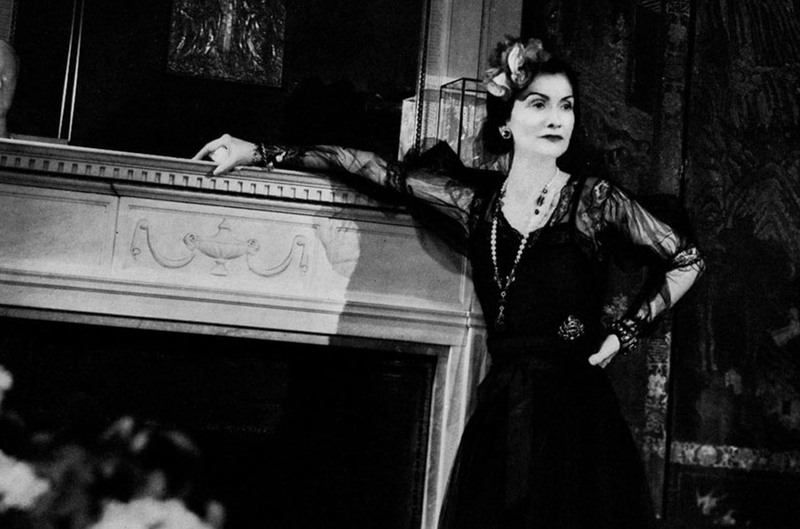 Coco Chanel’s debut marketing strategy for the scent involved inviting a group of elite friends to dine with her at a restaurant on the French Riviera, where she surprised them by spraying them with the perfume. 15. The official launch of Chanel No. 5 was in the label’s Paris boutique on the fifth day and fifth month of 1921. 16. In a 1954 interview, when asked what she wore to bed, Marilyn Monroe famously said: ‘Five drops of Chanel No. 5.’ – cementing the fragrance’s place in history. 17. Acclaimed British film director, Ridley Scott, directed TV commercials for No.5 in the ‘70s and ‘80s. 18. Australian director, Baz Luhrmann, directed Nicole Kidman in a short film for Chanel No. 5 in 2004. Other star faces of the scent include Audrey Tautou and Brad Pitt.